Phil McConkey wakes up with the same image in mind every morning. He is 27 again, a skinny kid from the west side of Buffalo. He barely weighs 160 pounds and hasn’t played American football for five years. And then he sets about trying to make his way in to the National Football League. “I had no chance. I mean I had no chance,” McConkey told OneWire‘s Skiddy von Stade. One of the first people McConkey, who was a nuclear weapons transshipment pilot with the US Navy, called was Steve Belichick, a former Navy assistant-turned-football coach and the father of legendary New England Patriots coach Bill Belichick. “He came out and timed me, and called Bill [Belichick], who was going into his first year as defence coordinator with the Giants, and it was [Bill] Parcells’s first year as head coach. I got there and I knew one speed, and that was all out, all day, every day,” McConkey said. 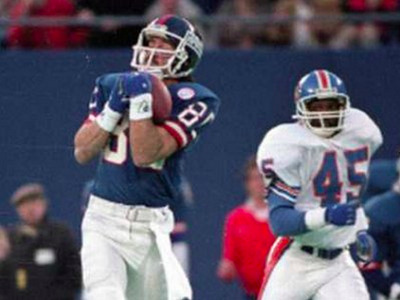 McConkey went on to win a National Football League Superbowl title with the New York Giants, before breaking into the cutthroat financial services industry. He is now president at Academy Securities, a broker-dealer founded in 2009 that employs veterans and service-disabled veterans in areas like investment banking and trading. I would tell them they’re capable of much, much more than they even dream of. That there’s no limit to the upside of what they can accomplish in life, as long as they remember teamwork and leadership.